Thanks to technology, designing and upgrading your home is more exciting than ever. In 2018, new trends are emerging that continue to integrate technology into the way we live our daily lives, especially at home. This gives us convenience and home control in West Palm Beach. Learn about these home technology trends and see how they can upgrade and enhance your life at home. Security is always a hot topic when it comes to home trends. This year, there is an increase in security products on the market. These new products integrate security with technology, giving homeowners increased control. Security cameras and motion sensors can all be integrated into your home. This can let you know when a package arrives, or when someone enters your home. Smartphones and smart TV’s make way. Your whole home can be smart now! This now includes your kitchen. This year, we’re seeing smart refrigerators that can let you know when you’re out of an item, and smart ovens that connect to your phone. On the smaller side, smaller counter-top gadgets, such as coffee makers, are also making mornings a little bit easier. 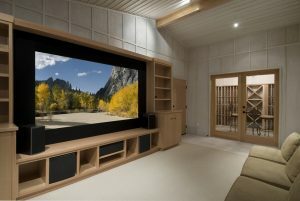 Larger TV’s are making home-movie nights and watching sports games a whole new experience. These new TVs from Samsung, Sony and LG can span your entire wall, providing the convenience and fun of an at-home theater. Look out for these massive TV’s to enhance your family’s viewing experience. Being in control of your home is always on trend. For the best technology trend products and home control in West Palm Beach, contact ETC Palm Beach. With top of the line products and services, your home will always be tech-savvy and on trend. Home Control Systems in West Palm Beach | What Can I Control?Smart Home Security in West Palm Beach | What Can I Control?